March can be a quiet month. We have gotten over the wild winter weather and are waiting for the warm sun to tempt the flowers into bloom. I think we should call March the KINDNESS MONTH. We can take the time to listen to people who are suffering on the inside, where it does not show. There are millions of people living daily with acute medical problems that are invisible to others. Having gone through cancer I can attest to this. No one knew I was sick until my hair fell out, creating a visible sign of my illness. During this time I met people at the hospital who looked as though they had just come from a spa treatment, not radiation. As we are repeatedly told that we look and sound fine, many of us feel guilty about being sick. We talk ourselves into believing that we must be doing something wrong because we are not beating it. The cultural message is that we have the ability to be healthy and it is up to us to pull ourselves together. 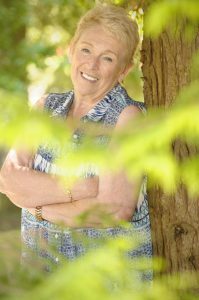 What I suffered from was not a chronic illness, but it seemed to take me a long time to recover from it. I used Melissa and Frankincense in my diffuser and had them diffusing most of the time. These are both very calming, anti-depressant and sedative essential oils. 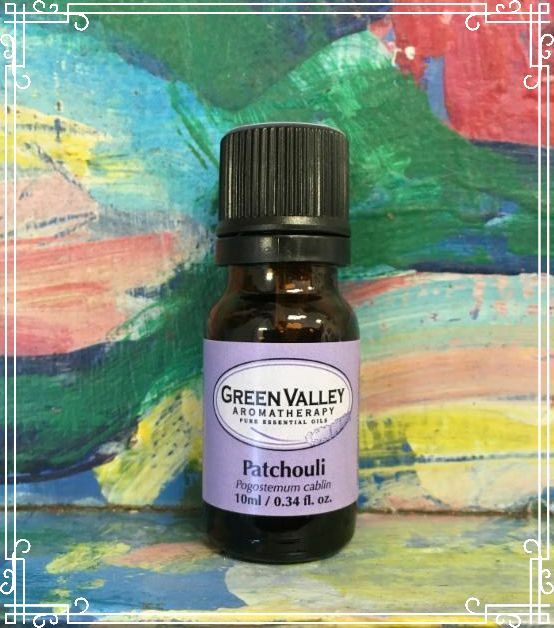 I knew about Patchouli essential oil long before I started training in Aromatherapy. Patchouli essential oil became famous in the sixties. Patchouli’s properties include; anti-inflammatory, antidepressant, anti-fungal and aphrodisiac. When you are camping or ruffing it among thousands of people, Patchouli would be a good oil to have around, though I suspect that it was mainly sought after for it’s aphrodisiac properties. Aromatherapy wasn’t well known back then, but people seemed to like the aroma of Patchouli and liked it’s calming effect. 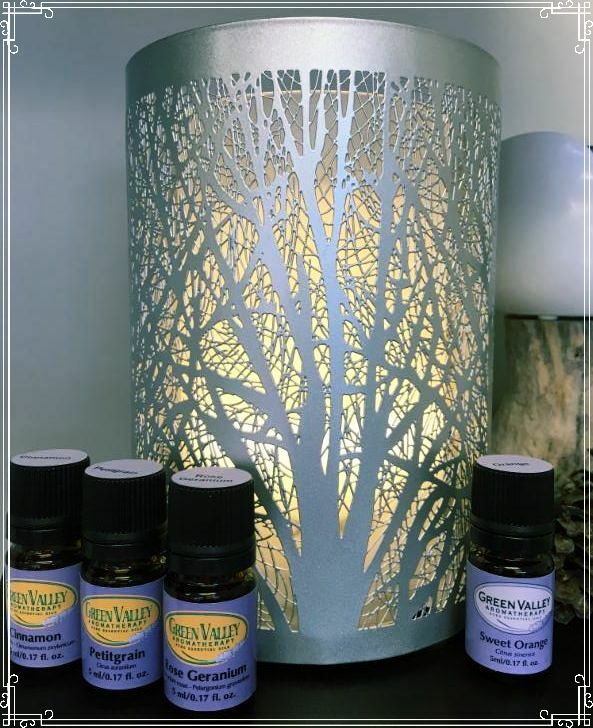 Within the Aromatherapy world we suggest Patchouli for anxiety or stress related issues, as well as to fight infections (cytophylactic – increases the activity of leucocytes). 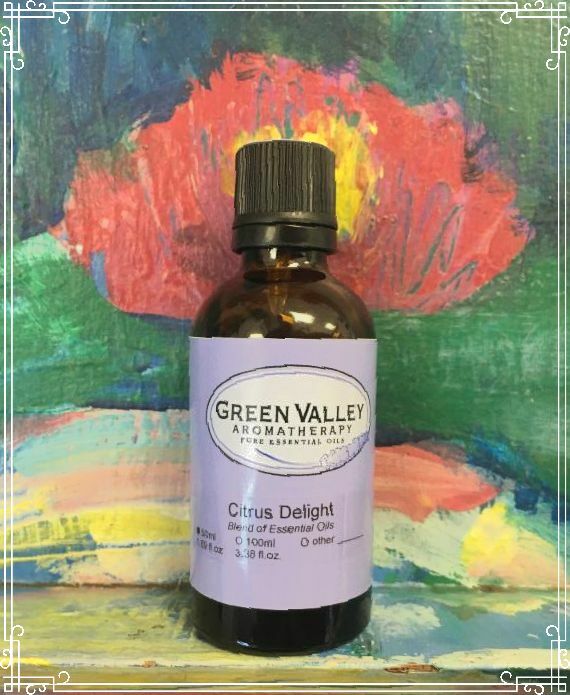 Citrus Delight is a pure essential oil blend of Cedarwood, Eucalyptus Citriodora, Lemon, Lime, Sweet Orange, Palo Santo, and includes Vanilla boosted extract. This new blend was created at the behest of our customers during the dark, winter months. Citrus oils are uplifting and are good to have around if you suffer from depression. Citrus Delight can give you a boost with its fresh, uplifting fusion of our wonderful citrus oils. The addition of Cedarwood, Palo Santo and Vanilla add some grounding and sweetness, making this blend a tropical delight. We are thinking of changing the name to Tropical Delight as it has more of a tropical, coconut scent, even though is is full of citrus oils. Eucalyptus Citriodora is gentler then Eucalyptus Globulus with a lemony scent. Lemon is an antidepressant, antibacterial and an immuno-stimulant. Lime is used for depression and aids the immune system. Orange is uplifting, a mild sedative, antidepressant, and is used for nervous tension and stress. Cedarwood is calming, and smells lovely. Palo Santo is calming, good for aiding meditation and concentration. Vanilla, while not an essential oil, blends well with the essential oils and creates a warm, smooth finish to the blend. Jojoba oils is excellent for all skin types. It is used to treat a number of skin problems. We suggest it for eczema, psoriasis and many more skin issues. Jojoba oil is actually a liquid wax. It has become known as the skins twin because it has a very similar structure to our own skins natural sebum. Jojoba oil is easily absorbed by the skin and has a non-oily, softening effect. 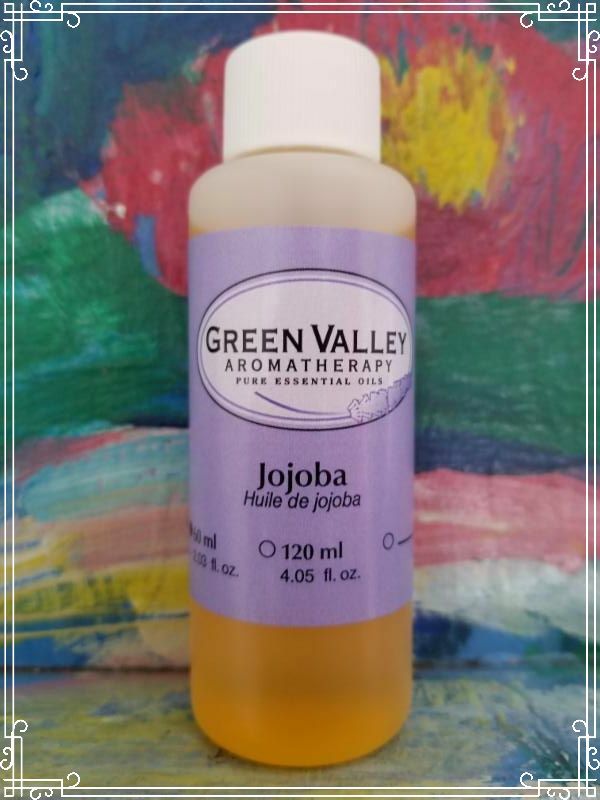 Jojoba oil can help to soften and unclog pores when used as a facial massage medium. It contains protein, minerals, plant wax and myristic acid (which also has anti-inflammatory actions). Jojoba is not a nut-based oil. May be used as a base or a 10% dilution. 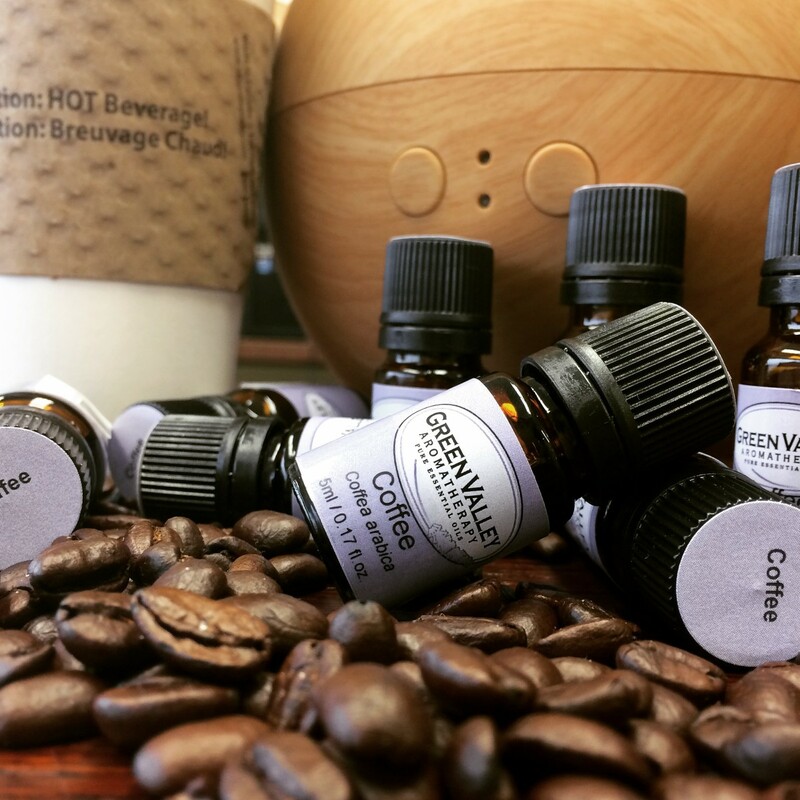 Try this diffuser blend recipe when you are in need of a pick-me-up. Mix the following in a 5 ml amber bottle. Add 5-10 drops of the blend to your diffuser. Pettigrain essential oil (middle note) is good for nervous depression, exhaustion and for when you are feeling tired and weepy. Orange essential oil (top note) is very uplifting, energizing and a good lymph stimulator. Cinnamon essential oil (middle note) has stimulating and aphrodisiac properties. Rose Geranium essential oil (middle note) is considered to be calming, uplifting and emotionally balancing.